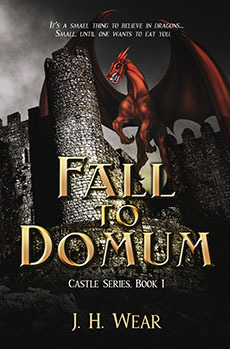 Melange Books - J. H. Wear "Castle 1: The Fall to Domum"
After inheriting an Irish castle, Jon and his girlfriend Liz find themselves thrust into the world of Domum. The two must search for a crystal that will aid them in finding their way home, if they can survive the dangers of the many harrowing twists and turns of adventure the two find themselves caught up in. ‘Relax And Take The Bus’. The words chiselled in the sign haunted Robert Jon McKinney as he peered out of the bus window. Jon had squeezed his bulk across the hard vinyl seats in a vain attempt to find comfort on the finely cracked green vinyl; the seat in front of him forcing him to sit slightly sideways. He ran his hand back through his short, dark hair to try to smooth it down. His girlfriend, Nadine Newman, described his hair like a dandelion ready to explode. He really didn’t think that it was an accurate assessment or a particularly funny one. Of course Nadine’s comments didn’t stop just at his hair, sometimes she indicated his weight was a bit on the high side as well. Actually, she more than just indicated, at times it made him wonder why she went out with him. Jon was a big man, and not soft, but he didn’t scare anyone when he entered a room. The sign, he recalled, had been on the chipped paint of a brick wall of an equally-worn building. He’d seen the sign on the cab ride from the airport, and it should have given Jon a hint of things to come. He’d felt a bit apprehensive about the final leg of his journey when the driver, a heavyset man approaching the age of retirement, yawned as Jon went past him. The bus, whose best years were behind it, was less than half full and Jon was able to have a bench seat for himself. An hour after lurching through stop signs and traffic lights the bus made its way into the countryside. Jon slouched in his seat and stared out of the window. Two weeks ago he had sat in a lawyer’s office, with Nadine, to receive an inheritance from his uncle, Gordon Miller. He recalled meeting his uncle only once as a young boy, when the tall, distinguished man had visited the family in Boston. Jon didn’t talk much with him, at nine years old he didn’t have a lot to say that grown-ups were interested in, but it seemed his mother’s brother took a liking to him anyway and left something for him in his will. At first he thought it was odd that he was left anything at all, but Uncle Gordon often asked about him in his letters and paid for a sizable portion of his college tuition. Nadine had to come along with him to the lawyer’s office and the family rumours of his uncle’s hidden riches made her excited as they exited the elevator on the twenty-fifth floor. Nadine, a short, small-boned blonde with her hair tied into a tight bun, preceded Jon into the office. They had to wait several minutes past their two o’clock appointment and Jon took in the thick carpet, the dark oak walls and the original paintings on the wall. He felt a bit intimidated wearing just a golf shirt and black jeans. A woman came from around the opening in the reception area and beckoned them to follow her. Unlike the receptionist, Van der Velde seemed to be pleased to see them and apologized for their wait. He stood up at his desk and opened his hand towards the chairs sitting in front. Van der Velde, a tall sixty–year-old with a slim frame, had retained most of his silver-white hair. Jon signed several legal documents as Mr. Van der Velde carefully explained the reason for each piece of fourteen-inch paper. Van der Velde paused and peered at them from the top of his bi-focal glasses. They nodded as they leaned forward in the soft leather chairs. He paused as Jon sat upright and Nadine gasped, covering her mouth with her hand. Van der Velde slid across the desk a set of folded papers. He lifted a bulging envelope. He held up a second envelope, this one flat. ‘Robert’ – Uncle Gordon had not known Jon had switched over to using his middle name – ‘I can only ask that you follow these final instructions as I have no way of enforcing them. I can only trust your own good judgment on these conditions.